ESTE PRODUCTO REQUIERE EL JUEGO BASE STEEP. Start your STEEP ride with the perfect set. 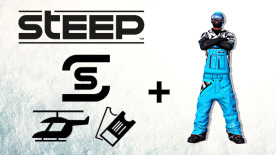 20 000 Steep Credits to complete your look with any equipments in the in-game store. 10 helicopter tickets to go anywhere in the mountains. Boost your ride with the Welcome Pack. This pack is working with Alps, Alaska & Japan maps. This pack is not part of Steep Season Pass & Steep Road to the Olympics Expansion. © 2017 Ubisoft Entertainment. The Steep Logo, Ubisoft and the Ubisoft logo are trademarks of Ubisoft Entertainment in the U.S. and/or other countries. All Rights Reserved.